UIIC Recruitment, JOBs at United India Insurance Company, Assistant Posts, Recruitment of Assistant Posts, Apply Online at ibps.sifyitest.com, Online Application Form. 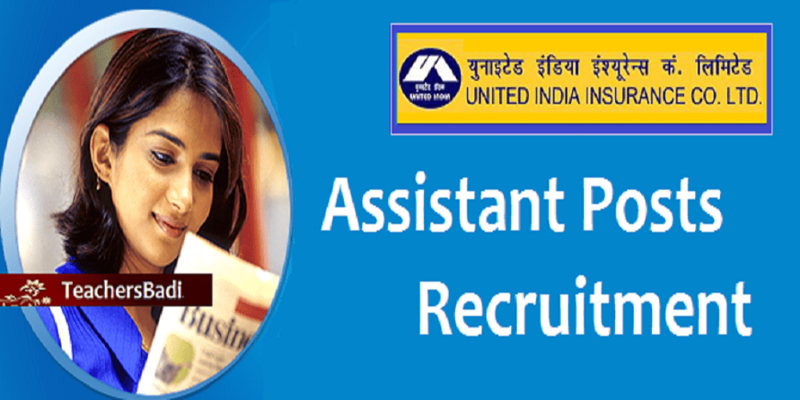 United India Insurance Assistant posts recruitment : Recruitment process for 696 assistant posts has been announced by United India Insurance Company Limited (UIIC). The online registration process will begin on 14 August 2017. Candidates can submit their applications along with the fee on or before 28 August 2017. UIIC has released the vacancy details state wise. 'Candidates can apply for vacancies in one State only and can opt for a Centre of that particular state only,' reads the job notification. Details of the recruitment process can be found at the official website of UIIC at uiic.co.in. United India Insurance Company, is a leading Public Sector General Insurance Company wholly owned by Government of India has issued a recruitment notification 2014 on November 17th, 2014. The UIIC invites applications from eligible Indian Citizens for the post of Assistants its offices all over India for its recruitment in Generalist and Specialist discipline. Graduates are eligible to apply for UIIC recruitment. Candidates must also have knowledge of reading, writing and speaking of regional language in the State of recruitment. Applicants must also be in the age group of 18-28 years (age relaxation norms can be found in the job notification at uiic.co.in). Upon selection, candidates will be on a probation period of minimum 6 months. As on 30-06-2017, Graduate from recognized University or Pass in HSC/ Equivalent (XII pass) examination with 60% marks(50% for Ex-servicemen, SC/ ST and Persons with disabilities). A candidate must be of the Minimum Age of 18 years and the Maximum Age of 28 years as on 30-06-2016. Candidate must have been born not earlier than 2-10-1988 and not later than 1-10-1998 (both days inclusive).Relaxation in upper age limit shall be applicable to special categories. Candidates can apply online only from 14-08-2017 to 28-08-2017 (both days inclusive) and no other mode of application will be accepted. Online examination will be objective type. The preliminary examination will comprise of Test of English Language, test of reasoning and test of numerical ability. The preliminary exam will carry 100 marks in total and the main exam will be of 250 marks. Special Recruitment Drive to fill the vacancies of Assistant for offices of State of Jammu & Kashmir..